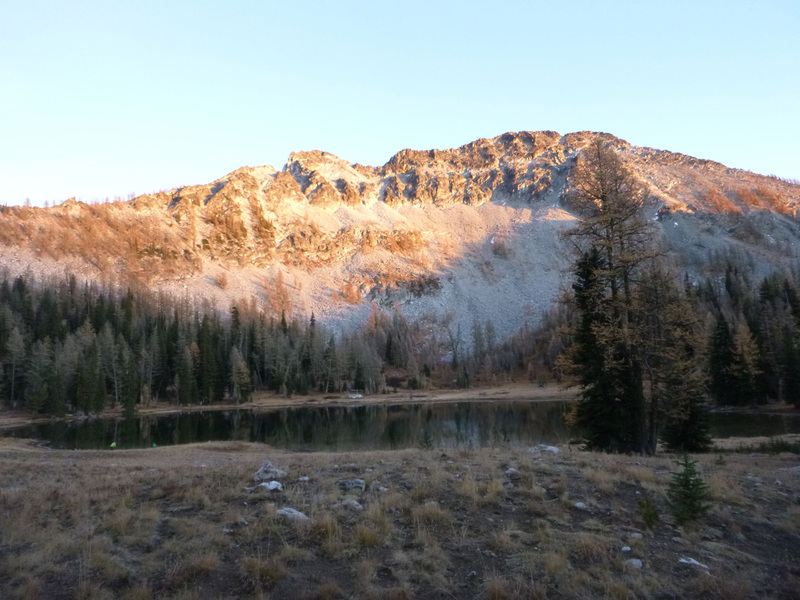 I thought I was finished with camping for awhile, but the crew rallied for one more trip to the Lake Chelan Sawtooth Wilderness. A windstorm two days before had whisked most of the fragile golden subalpine larch needles away from their twigs, leaving a pale carpet on the ground. Fresh snow dusted the peaks and lingered in the shade. The October sun was bright and warm, but the shade was cool. The high country was quiet (except for a few military jets roaring over). Clean, crisp, effervescent air filled our lungs, and I found my face turning to the brightness again and again. This time of year, you never know when it’s going to change so there is a sense of soaking up the good weather and subalpine landscape. That would be Boiling Lake! We were there a few years back right at this time of year with our friend, Bert. It was 12 degrees F one night! Used to be an FS Wilderness ranger tent platform and storage cache there. Pat Murphy was the ranger there in the 1970s.